Create exciting characters with any of our Character Kits. Each kit includes colorful, detailed, step-by-step instructions that make it easy to obtain professional results. These easy-to-apply creme makeups are washable and non-toxic. Realistic old age characters are easy to create with this kit’s special makeup and colorful directions. Read more...Components include: Old Age Foundation, Four Color Old Age Palette, Silver Grey Hair Color (.5 oz. ), Flat Brush, Sponge Applicators, Stipple Sponge. Create ghoulish vampire characters with step-by-step color photos for both male and female characters. Components include: Vampira Foundation, Four Color Vampire Palette, Stage Blood (.5 oz. ), Black Pencil, Flat Brush, Sponge Applicators. Witches and zombies look their “worst” with this kit’s creme color makeup. Components include: Witch Foundation, Four Color Witch Palette, Black Pencil, Quick Cleanse Remover (.5 oz. ), Flat Brush, Sponge Applicators. 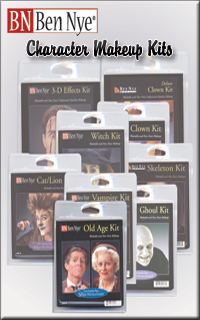 This kit’s ghostly effects are guaranteed to scare the daylights out of anyone. Components include: Skeleton White Foundation, Three Color Skeleton Palette, Black Pencil, Quick Cleanse Remover (.5 oz. ), Flat Brush, Sponge Applicators. Stylish feline characters are easy to design with this attractive kit. Components include: Cat Foundation, Four Color Cat Palette, Black Pencil, Quick Cleanse Remover (.5 oz. ), Flat Brush, Sponge Applicators. Perfect makeup for your favorite ghoul. Components include: Ghoul Foundation, Three Color Ghoul Palette, Black Pencil, Flat Brush, Sponge Applicators, Stage Blood, and Color Directions. The experts use these same professional quality makeups for simulated cuts, gashes, bruises, broken noses, and abrasions. Components include: Four Color Special Effects Wheel, Nose & Scar Wax (1 oz. ), Stage Blood (.5 oz. ), Spirit Gum (.25 oz. ), Spirit Gum Remover (.5 oz. ), Liquid Latex (.25 oz. ), Black Pencil, Flat Brush, Sponge Applicators, Stipple Sponge.